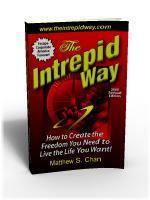 Kirkus Discoveries recently reviewed my book “The Intrepid Way”. I would say the review was mostly fair. However, I would say that including details was not part of the agenda of this book. There is no way any one book could contain all the details of everything I was explaining. Because the subject matter challenges conventional wisdom in an extreme way, I was pleasantly surprised that the review was not worse. Kirkus Discoveries is one of the book reviewer companies known for hard-hitting reviews. The Intrepid Way appeared to get through relatively unscathed. Chan (TurnKey Investing with Lease-Options, 2004, etc. ), once an in-demand technology consultant, found his career path too limiting like most professionals, his income was dependent upon how long and how hard he worked. He could charge higher consulting fees, but he could only work so many hours in a day. If he stopped working, his income would stop. To break free from this daily grind, he embarked on a new path, along which he developed the philosophy contained here. The fundamental principle of “The Intrepid Way” focuses on achieving personal freedom, which includes not only financial freedom, but also freedom of time. His strategy is based on income layers, which generate continuous income with little or no work or oversight required; many of the author”s revenue streams involve real estate and the Internet. Rather than outlining specific methods for creating income layers, however, Chan describes his own journey toward personal freedom, and how he can maintain the same level of success working as few as ten hours per week. He discusses the reactions of his friends and family to his decision to quit his job, and the emotional and intellectual support systems he had to create when others abandoned him. A thought-provoking introduction to an alternative way of conceiving wealth and work, The Intrepid Way meanders through the development of Chan”s philosophy and repeatedly rails against the narrow-minded people he”s encountered along the way. But readers will likely be disappointed that the author only briefly touches on a few concrete methods for creating wealth. To learn more, one must read his “TurnKey Investor” books.